Photo: Protest at the White House for Net Neutrality by Joseph Gruber. What if students couldn’t load Wikipedia and online library websites? What if teachers couldn’t use their personal websites to share and collaborate on content with students in class? What if corporations were the ones determining what educational content is available at schools? These unfortunate scenarios may happen if net neutrality does not exist, media scholars and professionals say. Having access to the Internet will not be enough. Having access to the right Internet offered by the right providers will determine the quality of education. Educators and learners will have to make sure that they choose and can afford to pay the networker provider who provides fast access all the important content providers, so they can use the Internet to effectively facilitate their education activities. In an environment where the principles of net neutrality is not maintained, the fate of world’s intellects – including teachers and learners of all ages – may be subject to corporate interests, which means innovations, solutions to world’s problems, and economies of the future are unlikely to prosper at the best possible nature. Coined by Columbia University media law professor Tim Wu in 2003, net Neutrality is a concept that Internet service providers and governments should treat all data on the Internet equally, not discriminating or charging differentially by user, content, site, platform, application, type of attached equipment, or mode of communication. No one on earth could explain something so critically important in an extremely funny way like John Oliver. How much is net neutrality known and supported by the public? The issue of Net Neutrality is critically important for anyone who embraces the Internet lifestyles or uses the Internet for some certain purposes, small or big. An online poll was done from May 15, 2104 to May 18, 2014 to find out how much Internet users know about and support Net Neutrality. There were 623 responses and the sample was American adult population. Unlike for-profit institutions and businesses, services and products, created as public and free, open-source resources for educators and learners to use, are unlikely to afford to pay for a “fast lane” connection in order to distribute their content and products to consumers. Without net neutrality, public content providers like libraries have to pay for a fast lane connection – which they normally can’t afford – to get educational, research, and archival collections out to leaners. Some of them even play very important roles in serving as gateways for hard-to-access information, and as lesser-used databases and niche research tools for academics. In classroom, some of online educational content and tools will unreliably load at different speeds shall net neutrality is not maintained. Network providers in favor of for-profit services will demote free, Open source and collaborative services. Students and teachers are only limited to a number of online services and products filtered by network providers. This means they can no longer enjoy startups’ free and low-cost services and products to creatively express themselves and collaborate in their work. A faster Internet for some means an unequal Internet for all. Network providers, favored by rules of law to create multiple versions of the web, will certainly cause erosion of freedom of speech and innovation. The public, thus, must pay close attention to the controversies around net neutrality. February 4, 2015, was the day FCC and US government made it official – or probably legal – that the Internet must be free of any arrogant internet-providing companies’ control, and it should be treated as a utility. It was a huge victory for the public, press, and major figures. Their reactions were loud and clear on the Internet. 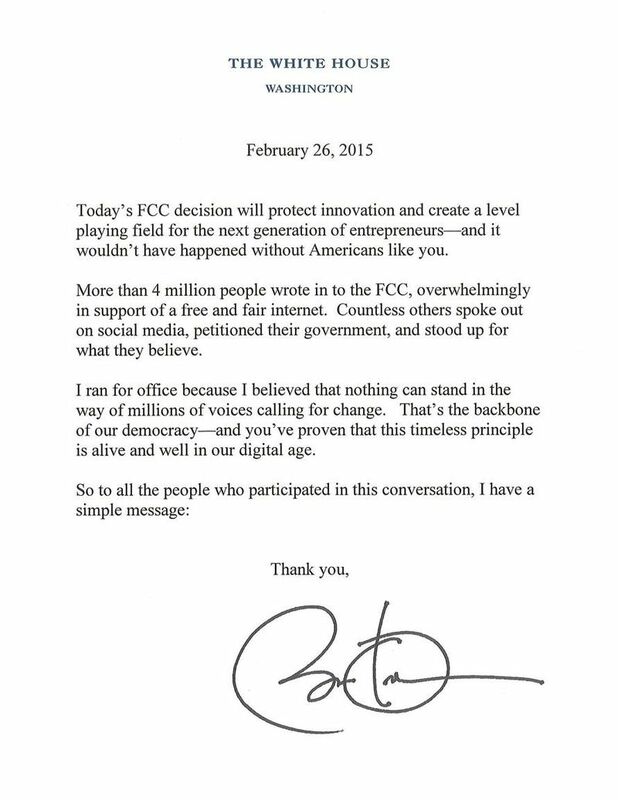 President Barack Obama’s response letter to the FCC’s decision to protect Net Neutrality. This decision to protect net neutrality will definitely leave those network companies in dismay. They will try to do whatever it takes to appeal this decision. Educators and learners should take this issue into serious consideration.